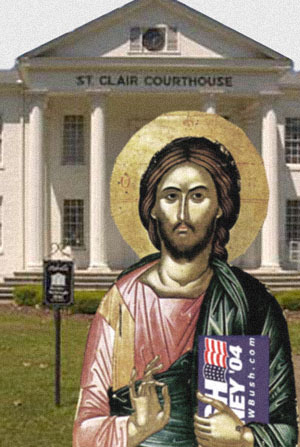 Ashville(JM) Jesus of Nazareth spent most of election day standing in the light drizzle outside the old Ashville Court House handing out copies of his 'Here's What Jesus Would Do' 2004 Voting Guide. According to Jesus He arrived at the polling place at 6:30 A.M. and greeted the workers before they set up. This is His third year handing out voter guides, but His first visit to God-Fearing St. Clair County. He enjoyed an early breakfast at the Court Street Café and then took His position just outside the 30 foot mark inside of which campaigning is prohibited by Alabama law. The guide, which is produced by Jesus in collaboration with Baptist Press, instructs voters about each of the offices and measures on the ballot. The most resonant issues, in Jesus's view, were the sanctity of life and traditional marriage, the war on terror, and the display of the Ten Commandments. On the moral issues Jesus's message is clear, "Marriage is between a man and one or more women and concubines. Homosexuality is an abomination before God and therefore undeserving of any health benefits or tax breaks that are given to truly married heterosexuals. Therefore, even though John Kerry is a good man and greatly loved by my Father and despite the fact that President Bush breaks commandments 3,4,6,8,9, and 10 just about every day, Bush opposes abortion and supports a constitutional ban on gay marriage so I recommend a vote for Bush in 2004." In the war on terror, Jesus expressed a change of heart that was made necessary by the events of September 11, 2001. "Before 9/11," he said, "My position was to love thy neighbor and thine enemies as thyself. But when I saw those towers fall on TV, I realized that you can't wait until the wheat sprouts and forms heads before you pull up the evildoer's weeds and gather them to be burned. You have to take the fight to the enemy. Bush is doing that, and I support the president. Besides, you shouldn't change presidents in the middle of an endless unwinnable ideological war." On the display of the Ten Commandments, Jesus expressed his desire to be in Alabama on election day: "This is a state where people realize that displaying God's laws on public monuments is the key to ensuring that those laws are followed and that God's will is done on earth as it is in Heaven. When Judge Roy prayed to me for a special exemption to the Commandment against the carved images, I was happy to let him off the hook for the betterment of Alabama. I am outraged that Activist Judges and Trial Lawyers tied to Liberal Special Interests have scoured all that is sacred from Alabama's Supreme Court. I stand here today, in front of St. Clair County's historic courthouse to tell all of Alabama that anyone who is endorsed by Roy Moore, or who touches his robes, will surely join me in paradise. Now get out the vote!" 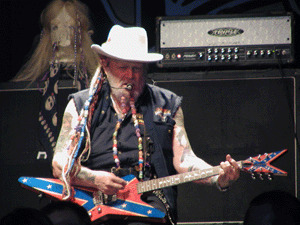 Montgomery() Voters in Alabama were able to stem the tide of miscegenation by narrowly rejecting Amendment Two, thanks largely to the efforts of country music legend David Allan Coe. While some opponents of the measure had attempted to confuse the issue by referring to imagined 'taxes' that would be created by Liberal Special Interests, Coe examined the amendment's language carefully and drew his own conclusions. "It's about my pretty white daughter being able to f*** a greasy n*****," said Coe. "I don't want that to happen, and I don't think the good people of Alabama do either." Col. Tom Parker (ret) was leading the anti-amendment efforts when he allowed Coe to step in and take charge. "I thought that the tax angle was the one to take," said Parker. "I mean we fought the fight against miscegenation on Amendment 667 and lost. We felt the only way to stem this tide of race-mixing was to couch it as a tax issue." Parker's followers were convinced that the passage in Section 256 of the Constitution of Alabama of 1901 as amended by Amendment 111 to the Constitution of Alabama of 1901 as amended, stating that "nothing in this Constitution shall be construed as creating or recognizing any right to education", would be tantamount to forcing whites and blacks to marry. Amendment 111 itself had already stricken the language stating "separate schools shall be provided for white and colored children, and no child of either race shall be permitted to attend a school of the other race." With this additional amendment, it was felt that Activist Judges would be able to use tax incentives to encourage if not force more race mixing. "We just didn't say it that way," said Parker. "We just told the people about the tax issue and hoped they would infer the ungodly part about race-mixing." Coe, however, felt less constricted and was able to distill all of that frustration down to its essence, and through his music help defeat the measure. Parker was ebullient at his election night headquarters when claiming victory in the Supreme Court race. "No more shall Activist Judges use judicial tyranny to make law and force gay marriage upon us. I will make sure that we enact God's law and make the display of the Ten Commandments a requirement. I stand for justice!" Parker then thanked Coe and gave the mike over to him to entertain the throngs of supporters gathered at the Embassy Suites in Montgomery. Coe then spoke about "women being next to be put in their place" and gave a rousing rendition of his classic 'Don't Wanna Wake Up Gay Married'. Montgomery(JM) Weeks of campaigning by opponents of a proposed amendment to Alabama's constitution have paid off. The proposal would allow the Alabama seafood industry to impose a fee on the sale of seafood or the purchase of fuel for licensed shrimp boats in order to fund public-education and lobbying efforts - specifically to counter the influx of cheaper imported seafood products into the market. 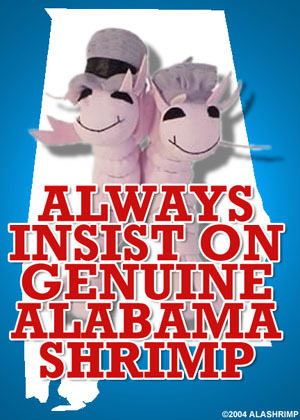 The Alabama Anti-Taxation League has been arguing in radio ads that the Fish & Shrimp Industry won't stop at imposing a fee on itself, especially if Activist Judges and Trial Lawyers in the pocket of Liberal Special Interests succeed in redefining all Alabama residents as members of the Industry. According to the narrator in the ads, you can expect that a vote for Amendment Four is a vote for sneaky back-door taxation. Meanwhile WTTO-21, WABM-68 and WDBB-17, all owned by Sinclair Broadcast Group, broadcast an Anti-Amendment Four pseudo-documentary produced by a previously-unknown organization called 'Shrimp Boat Captains for Truth', the documentary, hosted by Benjamin Buford 'Bubba' Blue, alleges that, during the Viet Nam war, many of the current members of the Alabama seafood industry have relatives that did everything they could to put American troops in danger. "Well, obviously," said shrimper Viet Kien Hoang of Belle Fontaine, "most of Alabama's thousands of Vietnamese, Laotian and Cambodian residents are involved in the seafood industry. It is not surprising that many of our fathers fought in the American War. But now we just want to be successful businessmen in this great country. We harbor no malice against the invaders. For example, we were happy to host Vice-President Gore, who served with the 20th Engineer Brigade at Bien Hoa, to our beautiful Chua Chanh Giac temple in Bayou la Batre"
Proponents of the measure said that the industry wishes it didn't need constitutional approval for a trade association, but it would not be in the power of the legislature to authorize our action without the ballot measure. Outraged that ultra-right-wing politicians would hijack the issue for what they believe to be personal gain, seafood industry organizers vowed to counter the so-called 'Shrimp Boat Veterans' with a privately funded voter-education campaign before the next referendum. "These guys use lies and distortions to incite fear among the voting public," said lobbyist Archie Trapp, "and it's just undemocratic to pander to Alabama's prejudice and ignorance." Montgomery() In his first official act as Alabama Supreme Court Justice, Col. Tom Parker (ret) announced that he will support a new constitution, one that is quilted and more absorbent. As it exists, the Alabama Constitution of 1901 would stretch from Montgomery to Memphis on Corridor X if all of its pages were laid out side by side. Although Parker does not believe in constitutional reform, he has stated that the document could be softer and gentler. "The constitution is not meant to chafe, although some people bound by it may think so. This new squeezably-soft 3-ply document will be much easier to handle." Parker continued to assure his followers that he has not become an Activist Judge bent on establishing rule by Judicial Tyranny. "I'm not going to let gay marriage sneak into our families and erode their very foundations. I'm going to enforce the display of the Ten Commandments as God intended our Christian state to do. We may be softening the constitution through quilting, but we still believe every word of its 1901 text." 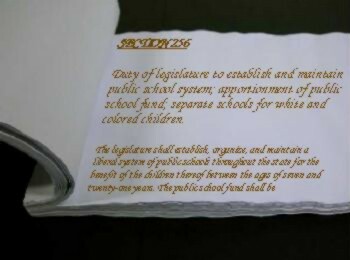 The new constitution will have two layers added to the gently quilted top layer of text. A special super absorbent middle layer will more easily contain the crap already inside while allowing detractors to continue to piss on the document. The final layer will be a harshly bleached super-white layer designed to enhance readability. Lawmakers used to the cumbersome old document will be tempted, but will be admonished not to 'squeeze the constitution'. Since the quilting process will double the size of the current constitution, a new public viewing room off of the Supreme Court rotunda will be constructed to house it. Special vacation packages will be promoted internationally by the state, which tout the chance to see the world's longest constitution and Confederate memorial all in one weekend. Tourism is expected to skyrocket now that the constitution is officially larger than North Korea's 12,317 proclamations by the Kim family.